In "Blueprint for a Battlestar: Serious Scientific Explanations Behind Sci-Fi's Greatest Inventions," NASA insider Rod Pyle explores remarkable and memorable technologies from the world of science fiction. Each concept is explained and dissected to reveal the real science behind it. Some are temptingly within our reach — such as cyborgs and artificial intelligence — others are further off, but fast approaching reality (think bio-ports or cloaking devices). Below is an excerpt of "Blueprint for a Battlestar: Serious Scientific Explanations Behind Sci-Fi's Greatest Inventions" (Sterling, 2016). Without doubt, the technological celebrity of Star Wars Episode IV: A New Hope was the death Planet known as the Death Star. It was the threat that hovered above a world...the target of the heroic pilots in their X-Wing fighters and the home base that Darth Vader so tenaciously defended with his wicked Twin Ion Engine (TIE) Fighters. The death planet seemed so effective that it was even the subject of a public petition sent to the White House in 2012. The suggestion was that the US should build its own Death Star, presumably to maintain law and order on some planet other than Earth. The tongue-in-cheek document garnered more than 25,000 signatures, enough to warrant an equally silly response from the Obama administration. They said the cost of such a device was estimated at about $850 quadrillion (which is even larger than the US debt,) and that it would take 833,000 years to create enough metal to fabricate it. The response further elaborated that the US government did not support blowing up planets and had tactical concerns about a weapon which could be destroyed by a tiny, battered one-man fighter. NASA may not be working on a death planet. But what would it take to actually build one? The first problem to overcome is sheer size: The death planet, as represented in the Star Wars films, is really big. Various sources have estimated its diameter at somewhere between 60–100 miles. At this size it would put most of the inhabitants of the asteroid belt to shame and, even though basically hollow, would have a small gravitational field and essentially be a mini-planet, if you will.If something that size was placed in Low Earth Orbit—the region around our planet extending to an altitude of 60–1,200 miles—a goodly chunk of it would be hanging down into the atmosphere, dragging and heating up and rapidly reentering. It would most likely crash into the ocean. Just getting the death planet into orbit in the first place wouldn't be easy. After spending nearly a million years to fabricate the metal, it would take an untold number of launches to get all that mass up there...enough to permanently poison the atmosphere. There is one way around this particular problem, however. There is plenty of metallic ore in the asteroids that roam the solar system. Most of it is in the asteroid belt and the Kuiper Belt (outside of Pluto's orbit,) but there are also plenty of rogue wanderers. Grabbing a number of large ones and smelting their ores down would net many millions of tons of metal that is already up in space...no bulk launches necessary for building materials. Of course, powering the mining operation itself would require solar panels, possibly thousands of miles across. If built on Earth getting the death planet into space would be daunting. The largest flying machine ever created was the Apollo program's Saturn V rocket, which weighed over five million pounds, when its fuel is included. It was about the size and mass of a World War II navy destroyer and, had it exploded, would have had the power of a small atomic bomb. All this explosive power was required simply to propel the tiny 12,000-lb capsule at its nose to the moon and back. Moving the death planet would require something hugely more powerful. Supposing a death planet could actually be built and powered, it would still lack the very nasty weapon the original version had. It is never explicitly said exactly what kind of weapon the death planet used to destroy Alderaan, but some documentation refers to the weapon as a "Super Laser." Laser is an acronym for Light Amplification by Stimulated Emission of Radiation (LASER.) This is a fancy term for 'coherent' light, a form of light in which all the waves cooperate to move essentially in unison. This can create a powerful beam that carries a lot of energy a long way, if the laser is powerful enough. Lasers have been around for about 50 years and are well understood devices, currently in use in everything from DVD players to military weapons. Once properly converted into energy, the mass equivalent to Mount Everest could power a single blast from the laser. Today's most powerful lasers don't even use electricity to power them. Instead they employ gases that are forced explosively through a large tube at high velocities. In the correct configuration, a gas that changes temperature rapidly enough can emit light, in this case coherent light. But you need a lot of gas, moving very quickly, to do this. The upside is that a lot of very powerful, hot light can be created for a brief time. The largest such lasers known today are the MIRACL (Mid-Infrared Advanced Chemical Laser,) made by the US Navy, and a US-Israeli collaboration called the Tactical High Energy Laser (THEL.) Lasers in this size and power range, the current upper limit, can shoot down artillery shells and small battlefield rockets up to five feet long and well under a foot in diameter. That’s a bit smaller than Alderaan. vaporizing matter gives off energy. How muchmatter would need to be flashed out of existence to create that much power? About the equivalent of the mass in Mount Everest is how much. We do have a lot of mass on Earth, enough to make many thousands of Mount Everests so as long as we're willing to dig enormous holes in our planet. The problem is to figure out a way to convert it into energy. 21.5 kilotons of TNT high explosive, or about the same explosive force of the plutonium atom bomb dropped on Nagasaki in the Second World War. So how many grams are in Mount Everest? The mountain contains about 365 cubic miles of mass, or about 6,399,000,000,000 metric tons. 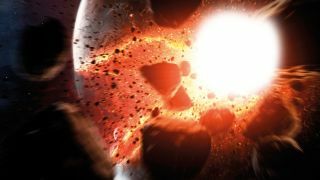 That's a huge amount of explosive energy to be released if we vaporized it, making it possibly more practical than a gas-powered death planet. Copyright © 2016 by Rod Pyle. Used by permission of Sterling. All rights reserved.